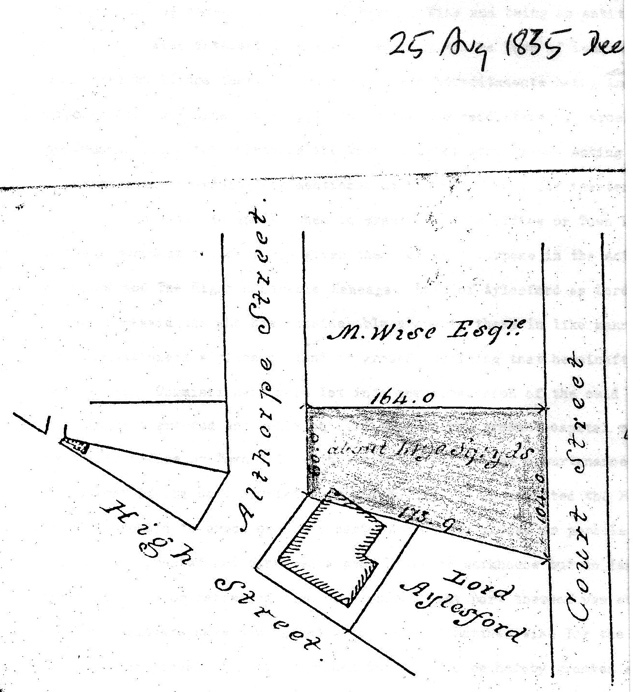 The site for the 1831 Town Hall is land at the corner of High Street and Althorpe Street. It was assembled over a long period and in a rather complicated way. 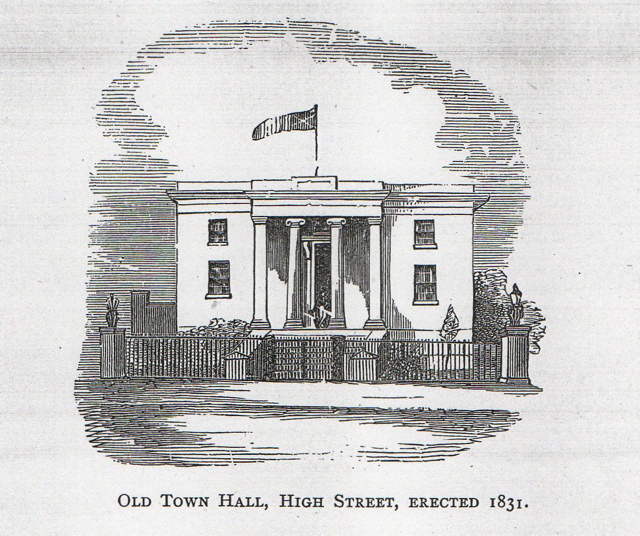 The first Town Hall was built by the Leamington Commissioners who had been appointed under the provisions of an 1825 Act of Parliament. They were in effect the town‘s first council, responsible for providing some basic public services such as paving and street-lighting. It isn‘t clear where they first met but in April 1830 they moved to the Petty Sessions Room in Church Street. In April 1831 they were still there, but were tendering to have it pulled down, along with the adjoining workhouse. The Town Hall deeds suggest that there was probably pressure from Lord Aylesford for them to leave, so he could take the property he had been promised. So the Commissioners needed to build somewhere for themselves, as their existing accommodation had to be surrendered. It was not the original intention to build a Town Hall on the corner site. Much of it was once part of a cottage garden, belonging to the Earl of Aylesford, Lord of the Manor of Leamington Priors, which stretched along the turnpike road, now the High Street and Radford Road, from the corner of Court Street to the corner of Camberwell Terrace. By an Indenture of Lease dated 23rd September 1814, and an Indenture by way of Exchange dated 24th September 1814, the Earl of Aylesford agreed to exchange a piece of this cottage garden, which had already been cut in half by the building of Althorpe Street, for 5 houses in Church Street, known as HardcornÕs Cottage, adjoining his other lands in Leamington. 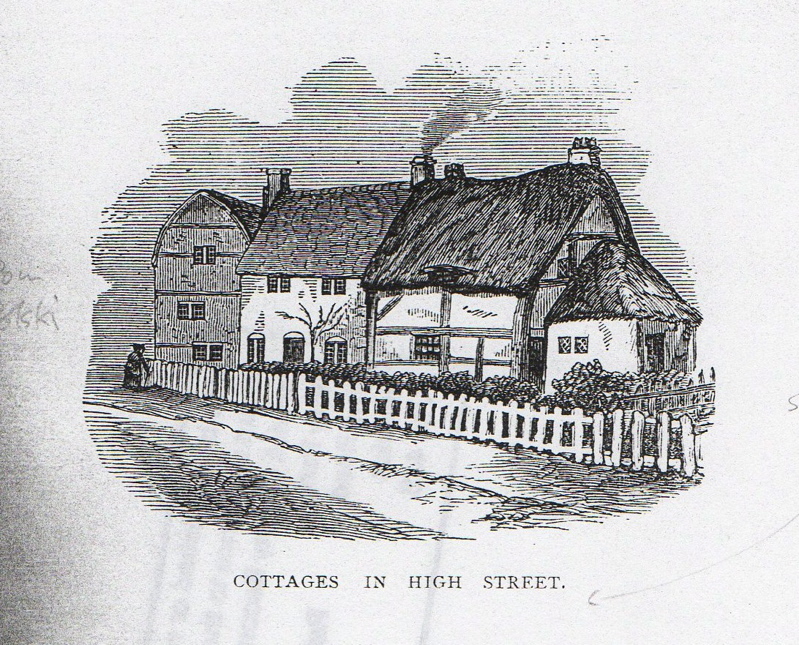 These houses had since 1768 belonged to the parish, and were used to house paupers. This was hardly a fair exchange, so the Earl agreed to pay an additional £120 in cash, to enable the parish to construct a new parish poorhouse. At the time, this was seen as a transaction favourable to the parish. It is not clear if any of this actually happened. 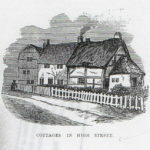 According to an Indenture of Conveyance dated 25th August 1835, Harriet Wise and her son Matthew sold 1,490 square yards of land between Court Street and Althorpe Street, backing onto the land supposedly exchanged in 1814 with the Earl of Aylesford, for £5 to the Leamington Improvement Commissioners. What is unusual about this, is that the Commissioners had by then already built the Town Hall and the poorhouse on the Aylesford land, and partly also on the Wises‘ land, with their permission, but without first buying it. A further surprise is that this land is now presented as the private property of the Wise family, whereas in 1814 it had been glebe or church land, administered by Rev John Wise in his capacity as vicar of Leamington. The Indenture also refers to the Earl of Aylesford giving the Commissioners the land mentioned in the 1814 Indenture (presumably for nothing), and to the fact that the Wises had given permission for the Commissioners to build a poorhouse on another part of their land, but did not sell it to them. 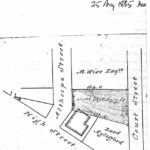 Map evidence suggests that the second poorhouse was constructed not on the land conveyed in 1835, but further along the Radford Road, although it is not known why the poorhouse was not built on the corner of Althorpe Street in 1814, as originally intended. 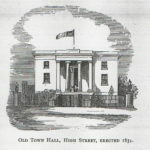 Subsequently a third poorhouse was constructed in Court Street, for which tenders were invited in April 1831. This was eventually left to the vicar to be used as a school from 7th December 1839. Given the decline in land values in Leamington between 1814 and 1835, it is not surprising that the Earl of Aylesford eventually gifted his land to the Commissioners, and this is confirmed in the Courier on 5th June 1830, but it seems strange that they chose to build the Town Hall on such an unsuitable site, even if they obtained it for nothing. The police cells in the Town Hall basement would have been prone to flooding from the outset, due to a stream which ran down Althorpe Street and then turned at a right angle into High Street. It seems clear that the Commissioners main concern was cost. In June 1830 they accepted a tender for £1,900 from the builder John Toone to put up the building, and excavation of the ground commenced within a fortnight. Toone was Overseer of Leamington parish and a notorious character who appeared before the Petty Sessions in June and November 1834, at which he was fined for constructing party walls of insufficient thickness. Nevertheless it is clear that the Commissioners intended to construct a much larger civic complex around the Town Hall, and to beautify the area with “ornamental buildings”, as explained in the Wise Indenture of 25th August 1835. The large building now occupied by the Christian Bookshop, and more particularly the extension to the former George Hotel on the corner of George Street, which is clearly aligned on the same symmetrical axis, and is meant to improve views from the ÒRoyal BalconyÓ of the Town Hall, point to this. The deeds of the Town Hall suggest that the Wise family were keen to have their part of town beautified with ornamental buildings, so given WiseÕs influence and wealth, it is hardly surprising the Commissioners obliged. The coming of the railway affected the setting of the Town Hall badly. The land bought from the Wises in 1835, and used mainly as a large garden, was sold to the railway, which built the viaducts just a few feet from the rear of the building.